I can honestly say this chicken lombardy isn’t a native dish, or even a family heirloom. Surprising, right? Since it’s Italian sounding? This is one of those much loved recipes that nobody is quite sure where it originated. We all seemed to find the ingredients & the instructions on Facebook though. Nothing wrong with that since there doesn’t seem to be an original source to give credit where credit is due. Disappointing though for the very same reason. Since then though, there’ve been a good many theories on where this recipe actually originated from. It’s automatically the best, classic Italian American thing to come out of my kitchen in the last 5 years. It really is that good. I’d heard a story that it was once on Olive Garden’s menu, but I haven’t found anything to back that account up. I mean, they do have a habit of naming their main chicken dishes after regions in Italy. Lombardy is a region in Northwest Italy too. So on that front, it’s a good guess. Still there’s another school of thought (and fans) that claim it originates from Wisconsin. The home of the late, great Vince Lombardi- infamous player and coach. Whichever version, whether true or not, they’re both great origin stories. Sometimes that’s all we can hope for. And this Chicken Lombardy is just about everything I could’ve hoped for and more. First off, this dish gives me an excuse to cook with wine. Wine is great for relaxing & enjoying, but it’s even better when used to cook with a meaty dish. I’m a sucker for a good recipe that includes wine. I offer no apologies either- wine makes virtually any dish’s flavor factor exponentially better. This dish is braised in it. Making it a natural to be at the top of my list. It also helps that it tastes amazing! 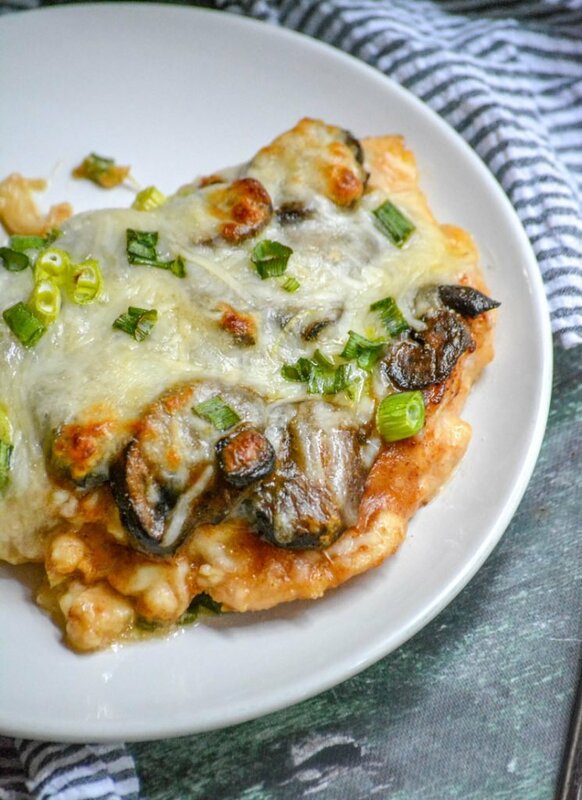 You add in the bonus of sauteed mushrooms, green onions, and a heaping helping of cheese? Sign me up. Sign me up on all the rosters! 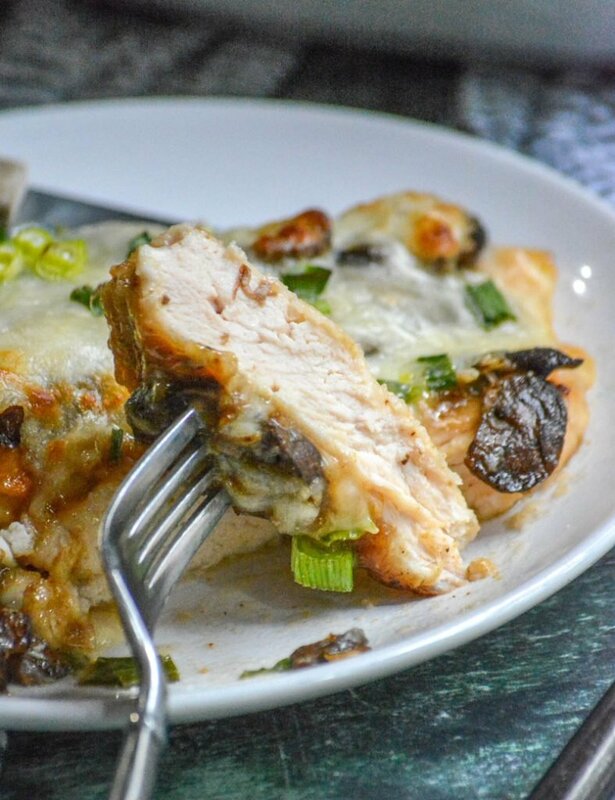 Not only did I immediately have to make this Chicken Lombardy, but I had to shout it’s praises from the roof tops. It is that good. Not a single bite disappointed. In fact, each bite left me aching for more! SO much more, that for the first month- it was a regular star on our weekly menu. I kid you not, every single week. Not once did it lose it’s luster either. Around the two month mark though, we tucked it into the trusted family recipe box- and decided we’d wait awhile to enjoy it again. It still makes an appearance at least once a month though. I’ll be darned too if it isn’t one of those meals that every single son manages to show up for. I’m always pleased, and they still haven’t figured out they’re secretly encouraging me. Plump chicken breasts are sliced in half, length wise, and dredged in flour. They’re then browned in a hot skillet with melted butter, and set aside to wait on a plate. The butter and browned bits are whisked together with a mixture of broth & marsala wine to deglaze the pan. This mixture’s left to simmer, thickening slightly. A cornstarch slurry’s stirred in to really let it thicken into a hearty sauce. 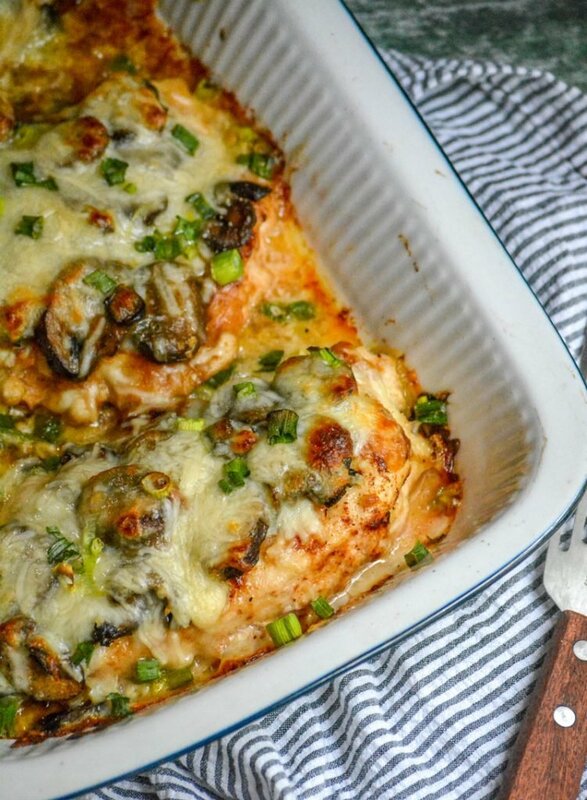 The browned chicken breasts are piled into a lightly greased 9×13″ baking dish. Overlap the edges a bit, if necessary, so they all fit. Careful not to actually pile them on top of one another. 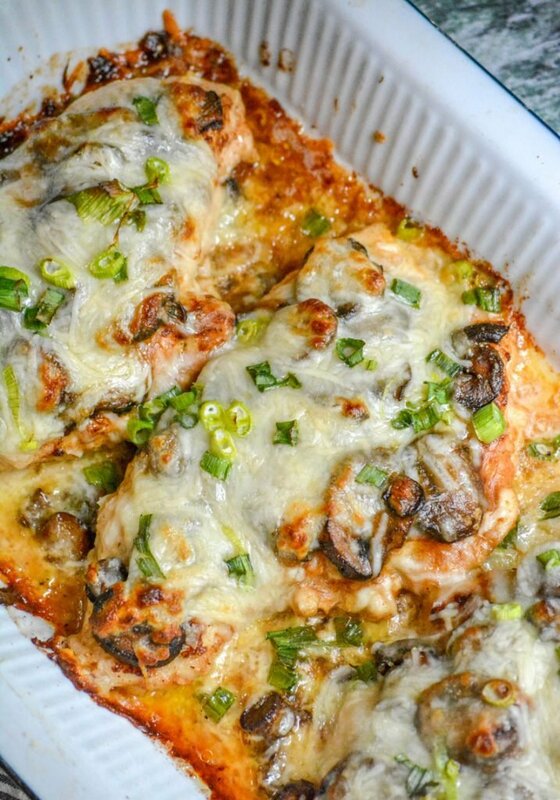 A layer of sauteed baby bella mushrooms is spread evenly out over top of the chicken, then the sauce is poured on. Topped with both shredded mozzarella & Parmesan cheeses, and a sprinkle of thinly sliced green onions- it’s already shaping up to be one heck of a dish. 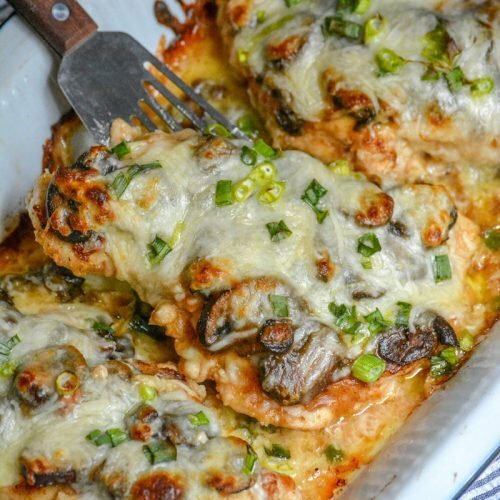 The Chicken Lombardy is then baked at 450 degrees for 15-20 minutes, just until the cheese is melted, bubbly, & beginning to turn golden brown at the edges. The dish is removed from the oven, with the chicken being served immediately. This entree pairs perfectly with a side salad, and your favorite pasta. 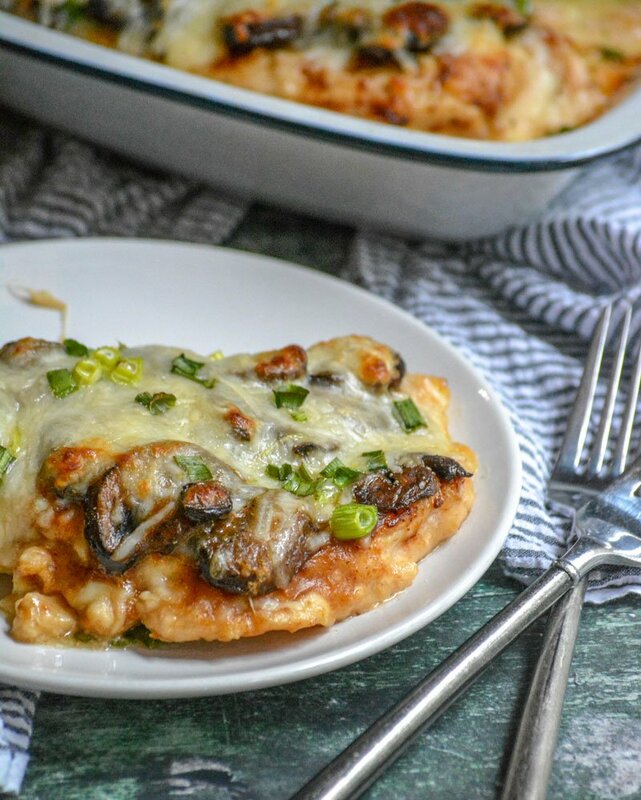 An explosion of flavor in every bite, this Chicken Lombardy is a gourmet dinner made on a budget in a fraction of the time you’d imagine. 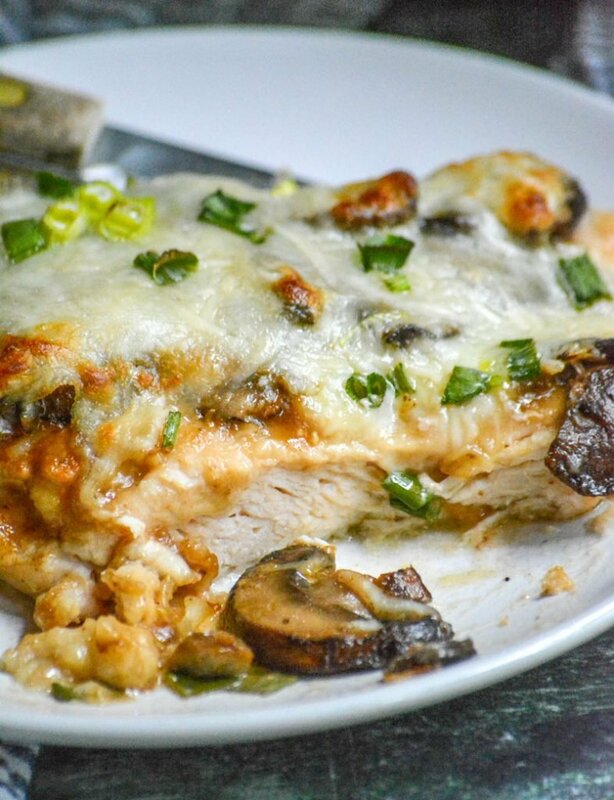 Flour dredged chicken breasts are braised in a buttery marsala wine sauce, topped with sauteed mushrooms, Italian cheeses, and tangy green onions for a signature dish that's irresistible. Cut each chicken breast evenly in half, lengthwise. One at a time, place a piece of chicken in between two sheets of heavy duty plastic wrap. Using the flat side of a meat mallet, flatten the breast out to a 1/4" thickness. Repeat for all the pieces of chicken. Melt the two tablespoons of butter in a large skillet over medium heat. Add in the mushrooms and saute for 3-5 minutes, or until tender. Remove the cooked mushrooms to a waiting plate or bowl, and set aside. Add the flour to a flat plate. Dredge each piece of chicken in it, making sure there's an even coat. In the same skillet you cooked the onions in, melt two tablespoons of the remaining butter. Add two pieces of chicken, and up the heat to medium high. Let the chicken cook until nicely browned on one side, flip and repeat. Transfer the browned breasts to a waiting plate. Add another tablespoon of butter to the skillet, and brown another two breasts. Repeat the steps until all the chicken is browned, and all transferred to the waiting plate. Stir the broth and wine into the drippings in the skillet, whisking to deglaze the pan and get up all those yummy browned bits. Season with salt & pepper. Bring the mixture to a boil, then reduce the heat and simmer for 5 minutes, or until thickened slightly. In a small bowl, whisk together the corn starch and water to make a slurry. Whisk this into the skillet sauce, and let it simmer another 1-2 minutes- until nicely thickened. Remove the skillet from heat, and set aside. Transfer the chicken breasts to a lightly greased 9x13 baking dish, overlapping a bit if necessary to fit them all. Spread the sauteed mushrooms evenly out over top. Pour the sauce evenly out over top of the chicken. Then sprinkle the cheeses evenly out over top, followed by the sliced green onions. 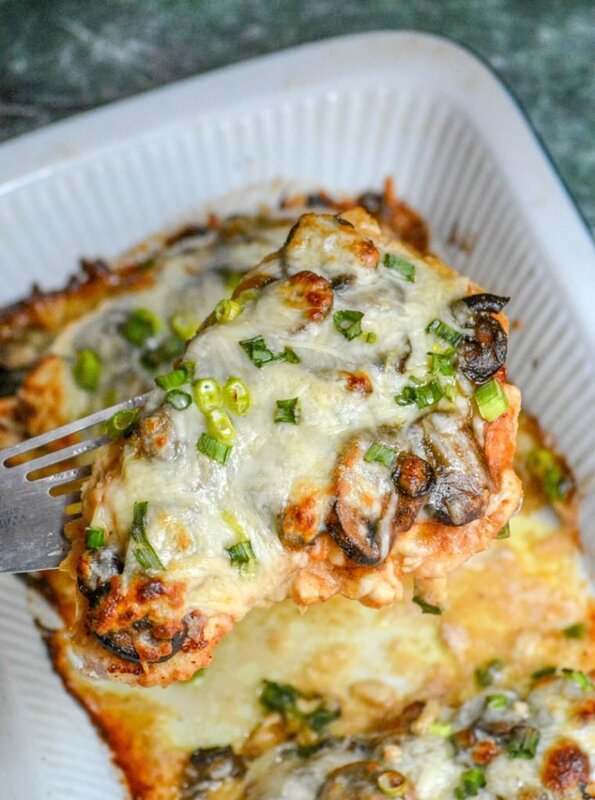 Bake the prepared chicken at 450 degrees for 15-20 minutes, or until the cheese is melted and slightly golden brown. Remove the dish from the oven, and serve immediately. Sounds delicious. What can I use instead of Marsala wine? Thank you. Are you not wanting to use alcohol at all? If so, I’ve seen this used as a substitute. Mmmm! 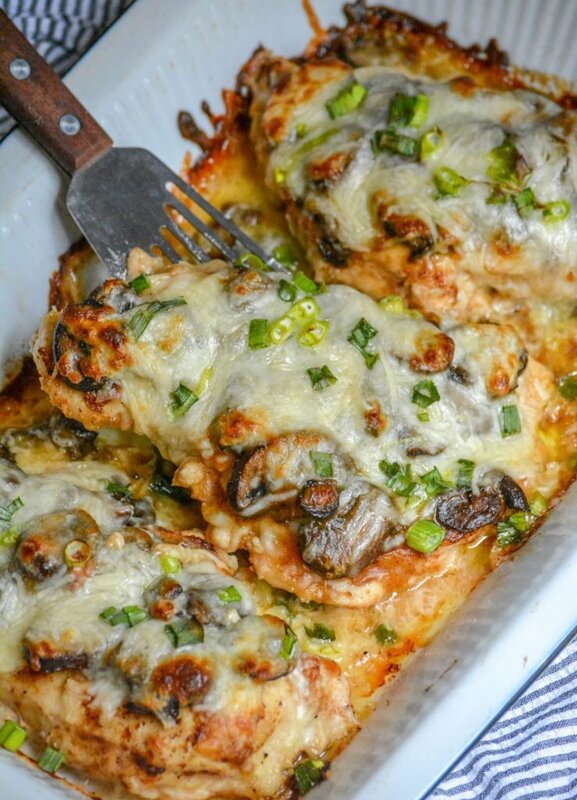 I am going to make this for dinner tonight! I just happen to have all of the ingredients right now! What a fabulous dinner! Thanks so much for bringing this beautiful dish over to Fiesta Friday this week! Excellent!!!!! I used chicken tenders! I also make extra sauce !!!! Highly recommend! I will have to try it with tenders next time, I’ve always got those on hand. And yes, I almost always double (or even triple) the sauce.